Epernay has a rich history dating back to Roman times. Scarred by ongoing turbulence, Epernay was badly damaged during the Hundred Years’ War and it wasn’t until the Duke of Bouillon was appointed governor in the early 17th Century that stability was found. Due to the constant destruction, the majority of architecture remaining today is from the 19th and 20th Century. Today, Epernay is a quaint historic town and self-proclaimed ‘capitale du champagne’. It is home to one of the most famous addresses in the world, the Avenue de Champagne, where a handful of prestigious producers decided to settle. 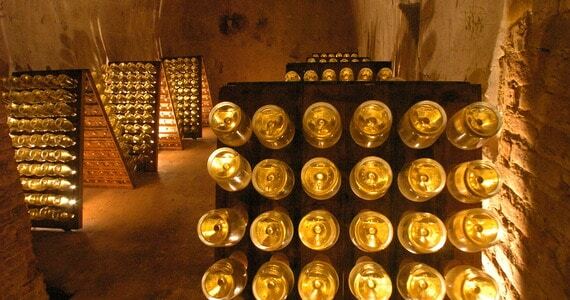 The oldest Champagne House is Ruinart, originally located in Epernay and founded by Nicola Ruinart in 1729. As mentioned above, Epernay is most famed for the Avenue de Champagne. Prestigious producers such as Moët & Chandon, Pol Roger, Mercier, Perrier-Jouët, Champagne Boizel and Champagne de Castellane grace the street lined with verdant trees and paved with bubbles. As you stroll along the avenue admiring the stunning architecture of the Houses, underneath your feet lie more than a hundred kilometres of tunnels, where millions of bottles of Champagne are ageing. Many of the Champagne Houses are open to visitors for tours of their extensive cellars, and offer the opportunity to learn about the fascinating Champagne making process from press to bottle. Though it is best known for the Champagne it produces, there are many places of interest to visit as well. The Château de Conde, a popular tourist sight, is now a private estate, with sumptuous 17th and 18th century interiors, requested by the Princes of Savoy. The house boasts breath-taking grounds and its long history (having served as home to series of famous French families) makes it a fascinating and beautiful building to visit. Other places of historical note are the ‘Portail Saint Martin’ which is the oldest monument in Epernay, and all that remains of the 16th Century Church of Notre Dame. The current Church of Notre Dame was damaged in the First World War and was rebuilt in 1925, however it still maintains an authentic appearance and is definitely worth seeing whilst staying in Epernay. 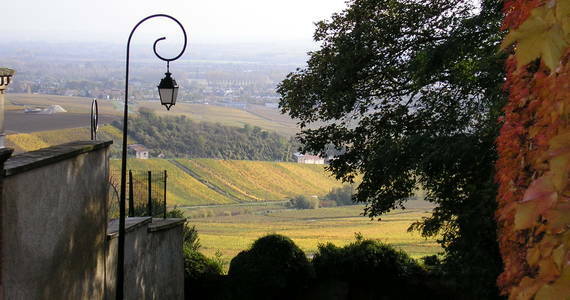 The most attractive and advantageous position of Epernay is its stunning surrounding vineyards. Nestled into the foot of the vine-covered hills, the town is enviably located for your oenological exploration. Located less than ten kilometres away from Epernay town centre, is the famous hill-top village of Hautvillers, also known as the “cradle of Champagne”. This small village is home to the remains of the iconic Dom Perignon. Dom Perignon was born to a wealthy family and after finishing his training as a Benedictine monk, came to the abbey in Hautvillers, where he earned himself the coveted position of procurer responsible for the wines owned by the abbey. During your visit to this picturesque commune, you will have time to admire the spectacular views across the vineyards and also visit the Church where Dom Perignon is buried. The visit is topped off with a comparative tasting session of three single varietal Champagnes in a quaint tasting boutique.